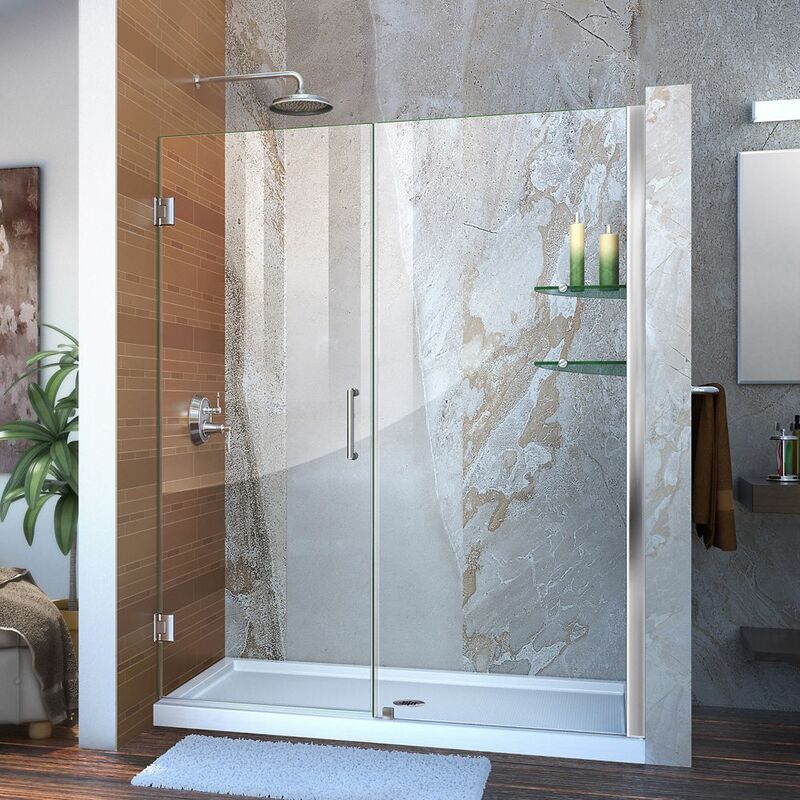 Unidoor 58 to 59-inch x 72-inch Frameless Hinged Pivot Shower Door in Chrome with Handle is rated 4.8 out of 5 by 10. Rated 5 out of 5 by Dan from Easy to install, love the two glass shelves that are... Easy to install, love the two glass shelves that are included with the door. Rated 5 out of 5 by Carol from We underwent a major remodel in our home in 2017. I wanted frameless shower door system. After ... We underwent a major remodel in our home in 2017. I wanted frameless shower door system. After the high cost of local glass company bids, i started my search and found these doors at Home Depot. They were ordered online and delivered to a local store, where out contract did the pick up and install. I love the coated glass that resist soap and water build up, which is well worth the money. They are a great product and looks great in the guest and master shower rooms. Rated 5 out of 5 by mike from Great item, i love the modern look, highly recommended. Great item, i love the modern look, highly recommended. Rated 3 out of 5 by Mamie from Chrime finishes do not match Prompt delivery. Good customer service from Bath Authority. Installer said directions were vague. The door and enclosure looks great once installation complete, except for... We ordered the chrome version, but the fixed wall panel apparently is not shiny chrome. The actual is somewhere between brushed nickel and chrome. Customer service said all finishes should be the same, they promptly sent us 2 different shipments of fixed wall pieces, both the same finish as original. Then customer service sent pictures (6) all had the same finish. At this point, we could uninstall door, fill drilled holes in wall, return door and start search over. We decided to live with two different finishes, I checked into having that pieced chromed too $$ after cost of door and having installer out three times. Rated 5 out of 5 by Sugarsue from Looks just as good as a custom door This shower door looks just as good as the custom doors we looked at for a fraction of the cost. Our contractor installed it, so I can't say how difficult or easy it was to install. We wouldn't hesitate to purchase this door again if the need arose.